Capable of punching . . .
(1) Mitsubishi Laser 2512HD-3016F16 w/ 4' x 8' Sheet Cap. 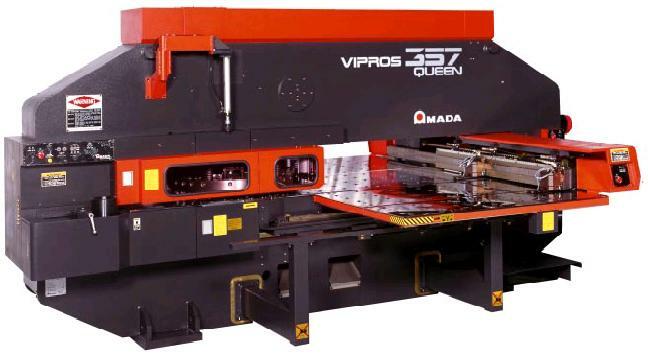 (2) 33 Ton Amada Vipros 357 Queen Turret Punch Press w/ 50" x 144" Sheet Cap. (2) 30 Ton Amada Pega 344 Q Turret Punch Press w/ 40" x 96" Sheet Cap. (2) Strippit Super 30 Single Punch Machine w/ 3/16" Mild Steel Cap. (1) 48" Ward Machinery w/ 22 Gauge Cap. (1) 18" Di-Acro w/ 18 Gauge Cap. (1) 8' Amada Power Shear w/ 3/16" Cold Rolled Cap. (1) 4' Whitney-Jensen Power Shear w/ 16 Gauge Cap. (1) 4' Pexto Power Shear w/ 16 Gauge Cap. (1) 3' Tennsmith Hand Roller w/ 22 Gauge Cap. (2) Studwelding Guns w/ 1/4-20 Stud Cap.